Happy Halloween to all of our readers and Friday The 13th fans! We know a lot of you will be out Trick or Treating during the day and night time hours, but we thought about giving our own kind of treat today in the form of some very rare behind the scenes photos from Friday The 13th Part 3. Andy's death is one of the most talked about scenes not only in Part 3, but within the whole franchise. His kill has never been seen in its entirety, but we all know how brutal it was by seeing the aftermath with Andy's corpse placed in the rafters. Due to the quick edits in the film, we only see brief glimpses of what transpired during his death scene. Below are some new angles and wide shots of Andy in his compromising position. In Friday The 13th Part 3, we never actually see a full frame shot of Andy during his handstand with Jason standing near by, nor do we get to see Jason standing in front of Andy and experience the would-be victim's facial expression and reaction. 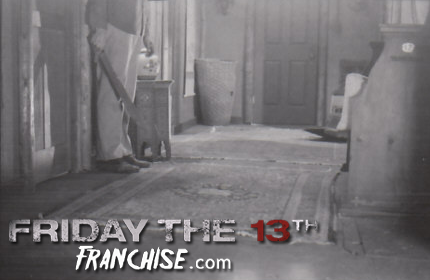 Check out the photos below and get a new perspective on a classic scene in the franchise!